Resurrection and Eschatology: Theology in Service of the Church: Essays in Honor of Richard B. Gaffin, Jr.
Lane G. Tipton and Jeffrey C. Waddington, Ed. 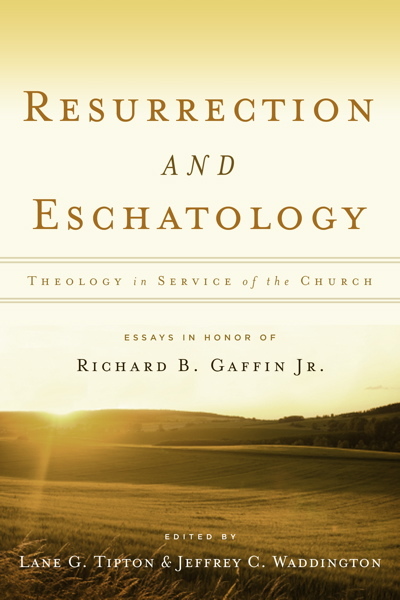 Resurrection and Eschatology: Theology in Service of the Church: Essays in Honor of Richard B. Gaffin, Jr., edited by Lane G. Tipton and Jeffrey C. Waddington. Published by P&R Publishing, 2008. Hardback, 586 pages, list price $29.99. Reviewed by OP minister John W. Mahaffy. Why peruse a collection of essays that has "eschatology" in its title, followed by two subtitles? Since theology is so often written by professional theologians for other theologians, what does "Theology in Service of the Church" mean? Answers are suggested by the third part of the title, where we learn that this collection of essays honors Richard B. Gaffin, Jr., who in 2008 retired after forty-three years of teaching at Westminster Theological Seminary in Philadelphia. Carl Trueman's foreword reminds us that Dr. Gaffin's academic life has been profoundly counter-cultural. For him, "theology is rooted in, and regulated by, God's uniquely authoritative revelation," Scripture. Furthermore, his scholarship "has been consistently aimed at the upbuilding of the church" (p. viii). That aim is reflected in the book's structure. Following a touching personal note from the late Dutch theologian Herman Ridderbos, Part One contains eight studies in biblical and systematic theology. For example, Dennis E. Johnson studies a perennially difficult passage, Romans 7:13–25. His almost persuasive contribution is one that students of that passage will have to consult as they wrestle with that text. D. A. Carson reflects on "what it means to preach Christ from all the Scriptures" (p. 134). Lane Tipton unpacks the Christology of Colossians 1 and Hebrews 1. Part Two consists of studies in historical and polemical theology. William D. Dennison and J. V. Fesko shed light on the development of biblical theology. William Edgar argues that Geerhardus Vos's "entire theological scheme represents a marvelous defense of cultural engagement" (p. 386). Mark A. Garcia, drawing on Gaffin, Calvin, and Paul, helps one understand why this book is entitled Resurrection and Eschatology. The contributions in Part Three, "Studies in Pastoral Theology," were written by former students of Gaffin who are now ministering in the church. As one deals with both minimalist views of the sacraments and positions approaching baptismal regeneration, James J. Cassidy's essay on "Calvin and Baptism" is a must read. The body of the book concludes, appropriately, with three sermons preached to God's people. Reading Resurrection and Eschatology cover to cover is both exhilarating and exhausting. There is not a bad chapter in the book. The variety ensures that any serious student of Scripture will benefit from reading in the book, appreciating that Christ's resurrection brings us into the (already here) last days. An unfortunate typographical error leaves incomplete the reference to Gaffin's service on the Committee on Foreign Missions. The reference on p. xi to the longest continuous presidency of a standing committee of the OPC should read: "president 1972–1976 and 1981–present." In his time, as well as in his theology, Richard B. Gaffin, Jr., is a servant of the church. For that we give thanks to God.